Rising Starz and NorthStar gymnastics teams both fared well at the Xcel Platinum & Diamond Michigan State Championships March 15-17 at MSA Woodland in Grand Rapids, MI. Rising Starz were crowned State Champions in the Platinum division with a team score of 113.200, while NorthStar claimed eighth in the 52-team field with a 110.350. 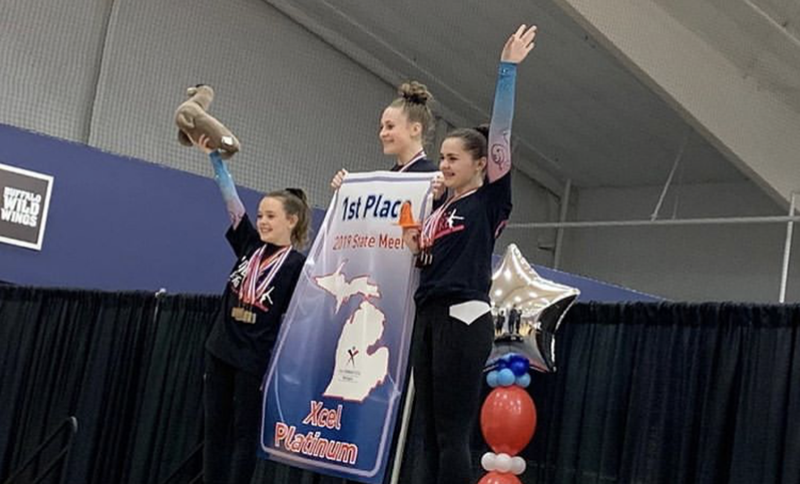 Leading the way for the championship was a trio of gymnasts whose scores qualified them to represent Team Michigan at the Regional Championships May 3-5 in Kentucky. Kate Tracey captured first All Around (37.650) in the Junior B Division with gold on Bars (9.625) and Beam (9.575). The All Around score was the second highest among all Platinum participants. Kendall Pinkelman and Aviela Einfeld posted the fifth-highest All Around scores at the event to qualify as well, each with a 37.450. Pinkelman’s 9.625 on the Beam is actually a Top 100 score on the apparatus this season. NorthStar was paced by Eva Ezell with a 36.950 All Around score that featured a third-place finish on Vault (8.950). Maya Anderson was next with a 36.450 All Around, aided by a gold medal on Floor with 9.450 in the Senior A Division. Overall the two gyms qualified 23 gymnasts for Regionals which require a 35.000 All-Around score. In the Diamond Division, Rising Starz finished third in the 22-team field with a score of 110.200. Northstar does not compete in the division. Lacey Scheid led the team with a 37.300 All-Around score, fifth among all Diamond athletes, qualifying her for Team Michigan at Regionals. Her score was aided by silver medals on Floor (9.600) and Vault (9.200). The team qualified all four of their gymnast for Regional competition in Olivia Thornley (36.300 AA), Anna Tracey (36.125 AA) and Elsa Brillinger (35.800 AA). Both gyms will be back in action that last weekend of the month (March 29-31) for the Xcel Silver & Gold State Championships in Pontiac, MI.